Authentic charcoal Japanese-style barbecuing anywhere. Savour the rich aromas of charcoal-cooked chicken and yakitori thanks to this portable hibachi grill, delivering delectable Japanese-style grilling with minimal space. Enjoy authentic charcoal cooking on impromptu picnic dates or camping with the incredibly compact, Japanese-style Cookmaster Hibachi Grill. Thanks to the portable design, you can take this grill almost anywhere – simply slide in the boot for road trips or a barbecue at the park. 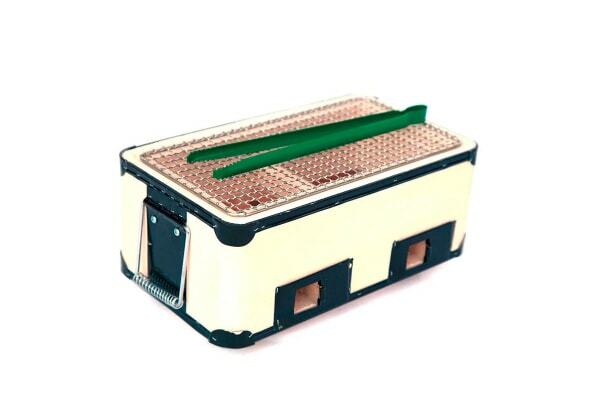 The ceramic construction retains heat for more efficient grilling, while the elevated stand minimises heat transfer to maximise the sear on skewers and scallops. The clay firebox can infuse an earthy aroma into your steaks, while the two charcoal chambers allow you to cook at two different heats simultaneously.